In 2008, brothers Andreas and Marco Biergen opened their sneaker store Afew in Dusseldorf. Since then, the store has grown into once of Germany's most influential stores in the field with own limited edition models, regular camp-outs and lots of illustrious customers. After several months of rebuilding measures, the store is finally celebrating its official reopening this Saturday, March 25, with a doubled sales space. 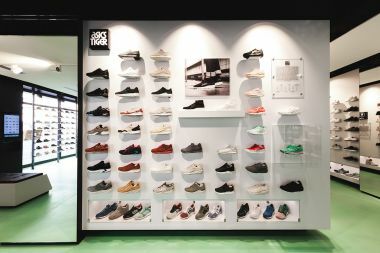 Following a concept of transformable architecture, the whole store concept was equipped with magnetic walls and elements. This way, the Afew sneaker store can be easily transformed into a gallery, a consignment store or event location. Next to digital tools such as flatscreen counters, the new store design features a special lightning system as well as the store's signature green “Glow in the Dark” Floor, which is fluorescent and a reason to visit the store even ofter opening hours. For the opening days, the store owners installed artworks by Futura or Ricky Powell and a selection of Be@rbrick bears in their exhibition space plus highlight a few of their personal vintage sneaker "grails" such as the Nike Equator from 1984 or more recent collectibles such as the Air Jordan 1 OG „Shattered Backboard“.